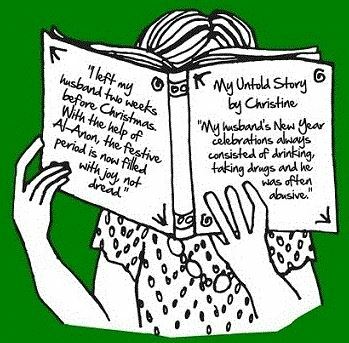 Christine describes the devastating impact alcoholism has had on her and her family. 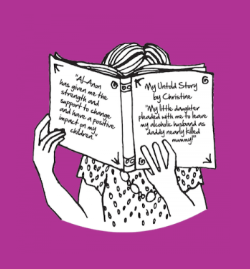 From growing up with an alcoholic mother, to being drawn to alcoholic partners who were abusive, she describes how Al-Anon has given her the strength and support to change and have a positive impact on her children. “I grew up in, what looked from the outside, as a typical family in the 1970’s. Husband and wife with two kids. The reality was quite different. My parents both had addict fathers and my sister had anger issues. My mother was an alcoholic who drank daily, and my father always took her side and protected her from any harm. My earliest memory of childhood was when I was three years old - playing a game with mum; topping the alcohol bottles back up with water so that dad wouldn’t notice she had drunk all of the drink. I knew even at that young age that what we were doing was wrong, especially when mum told me to keep it a secret. I learnt early on from both my parents to keep secrets and to never speak the truth about mum’s drinking to anyone. Even when mum was drunk for all to see - stumbling, slurring her words and talking nonsense - we all pretended everything was fine. I felt embarrassed, ashamed and responsible. I doubted myself and wondered if I was exaggerating about mum’s drinking. I resented dad for not stopping her. I didn’t feel good enough and unloved by my mum - because if she loved me she would stop drinking. My mum was a nasty drunk who would scream at me and throw me out on a regular basis. I would wait until early evening when I knew she would be unconscious on the sofa to return. This carried on for years until one day I didn’t go back. I was 17 years old and felt rejected and alone. I rushed into a relationship with the first person who showed me some attention so that I could start a family of my own and make everything “right”. We married and had two children; again it looked from the outside like a normal family. The truth was that I felt trapped with my husband who was physically, emotionally and sexually abusive. I tried to hide what was happening from our children though the abuse progressed and eventually it got to the point where my seven year old daughter stood in the door way pleading with me to leave because “daddy nearly killed mummy”. I knew she was right so we waited for my husband to leave for work the next day before escaping. Although we escaped I couldn’t escape from myself. I felt like a failure; I believed all the hurtful words my husband had told me. I was suffering from depression and an eating disorder whilst trying to make a home for myself and my children. Six months later I found myself in psychiatric unit after attempting suicide. It was while I was in hospital that I first admitted the truth about my childhood and abusive marriage. I also met the next alcoholic in my life; he was in hospital because of his alcoholism. He was very loving which was what I had always craved, although he was also very demanding. My doctor suggested that I go to Al-Anon for support and although I knew I was desperate to feel better it took another year and more suicide attempts before I finally went to a meeting. The alcoholic and I were together three years before we parted - a short time but he had a huge impact on my children and I. Alcoholism is a devastating illness which affects everyone in contact with it. My children were brought up by an alcoholic/addict father and an adult child of an alcoholic hence they have been more than a little affected but with the help of Al-Anon I have been able to change and have a positive impact on my children. My dad sadly passed away in 2009 and left an alcoholic wife alone. I was grateful that I spent my dad’s last week in hospital with him. The week my dad died was the last time I experienced my mum drunk. The only side effect of more than 40 years of daily drinking was that she developed the shakes, or so I suspected. After a year, I discovered that she was actually having symptoms of Parkinson’s Disease and dementia. I became a full-time carer for my mum. My New Year's Eve experience ! "December time filled me with dread rather than excitement. Traditionally New Year’s Eve always involves people drinking alcohol, but that was something that never triggered happy memories for me. My early memories of New Year’s Eve were always spent in the same way. The whole day was a good excuse for mum to get drunk. She would stumble, slur her words, talk nonsense, start arguments and created an uncomfortable atmosphere. At midnight we would then open the front door, as did every household in the street and shout “happy new year!” Although the evening had been unpleasant, we all pretended everything was fine. I enjoyed those five minutes standing at the front door pretending we were a normal, happy family. When I started my own family we never carried on the tradition. I was hoping to somehow make all past Christmases and New Year’s Eve ‘right’ by making future ones joyous and peaceful. That never happened, and it made me feel like a failure. I tried to protect my children from witnessing my husband’s behaviour during New Year’s Eve by sending them to stay at my parent’s home overnight. I would ignore my husband’s New Year tradition (which consisted of drinking and taking drugs) by going to bed early. I would be asleep before midnight; avoiding all the unrealistic and high expectations about how wonderful seeing in the New Year would be. My sleep was always interrupted, and I would be woken by a kick or a punch from my husband. As I mentioned before, my husband was physically, emotionally and sexually abusive. New Year’s Eve was never a happy time for me, I felt trapped and alone. I would sit looking out of the window daydreaming about how other families were spending their Christmas and New Year’s Eve. Was everyone’s celebrations full of happiness and laughter except for mine? I finally found the courage to leave my husband two weeks before Christmas. It was one of the scariest moments of my life, but the relief was overwhelming. I spent the following New Year’s Eve wide awake! Being alone with two children came with new challenges but it was worth it. Since then, every December has been filled with joy. Alcoholism is a devastating family disease which affects everyone in contact with it. Whilst attending Al-Anon Family Group meetings and with the help and support of other members I was able to change myself. In doing so it had a positive impact on my children. I then went on to meet my new partner who was a kind and gentle man, and started a healthy, loving relationship. He taught me how families could enjoy spending time in each other’s company and celebrate the New Year without excessive alcohol. I began to spend New Year’s Eve with my children, partner and sometimes with his family. The time we all spent together helped me create new and happy memories, I learnt how to feel excitement rather than dread."